While today's indexed shifting can make shifting nearly effortless, when problems arise it can be annoying or even dangerous. A sticky, grinding or a jumping chain means it is time to inspect and adjust your rear derailleur. This job is best done after chain has been cleaned and lubricated. Adjusting a rear derailleur is a relatively easy step by step process that only requires a standard screwdriver. 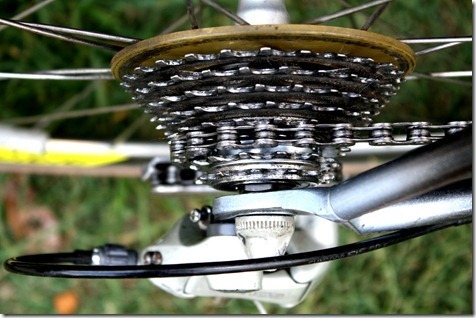 Derailleur alignment –this is the derailleur's alignment relative to the frame and drive train. The rear should hang parallel to the plane of the bike. This can be noted from behind the bike. Cable tension - this is controlled by barrel adjusters on the shifters on mountain bikes, derailleur body on all bikes, and in the case of road bikes at the down tube cable attachments. Stop or limit screws - two screws on the derailleur body limit how far the derailleur can swing to the outside (H) and to the inside (L); both keep chain from shifting off the cassette. This is where you will use a screw driver to adjust. First, inspect cable and housing to make sure they are not rusted, split, or cracked. If the cable does not move freely then watch video on How to Change Rear Derailleur Cable. Next, inspect chain for stiff links or bends by running chain backwards to see if it jumps. If jumpy, sticky or skipping, then you can try flexing back and forth to free. If links remain sticky, then check out another video on chains for instructions on how to fix. Next, If cable and chain are good, check derailleur cage alignment visually from behind the bike. It should be parallel to rear plane frame. If parallel, then you are ready to set H stop screw. If not dial in with H screw until aligned. Shift derailleur to highest gear or most outboard. Look at pulley cage if it is too far outboard turn screw. If too far in turn (H) one turn counter clockwise. If not then check cable tension with barrel. Try shifting to next cog up if it makes the shift quietly, then skip ahead to setting ( L) screw. If not, then turn barrel adj to align with second cog. If good but noisy then fine tune tension with barrel adjuster to fine tune. Move chain to lowest gear (largest cog near the spokes) and then check cage to see if it is directly under with cog. Once you have done that, then shift up and down the gears while pedaling with your hand noting where any fine tuning is still necessary. Fine tuning can be accomplished through barrel adjusters on the shifters, derailleur body and on the downtube mounted barrel adjusters for road bicycles.